Very few presenters seem to know that it is not only possible to broadcast Live PowerPoint presentations online but in many cases you can also gather audience feedback and enable them to follow your slides on their mobile devices. Most services which offer this functionality are free and Microsoft itself has a free service for this purpose. Here are a few methods by which you can broadcast PowerPoint presentations Live. For those of you looking to broadcast your PowerPoint slides Live via the Internet, one of the easiest methods can be to use the default PowerPoint broadcast feature, known as the Office Presentation Service. You can launch this service via the Slides tab (in PowerPoint 2013) and begin broadcasting your slides online. Your slides can be followed via a direct link that you will be provided. Your audience can follow your slides, as you present them via this link. Here is a quick tutorial to show you how the Office Presentation Service works, courtesy Elaine Giles YouTube Channel. Presentain is a web service which allows end users to upload a PowerPoint or PDF presentation which can be broadcasted via the Internet. You can share the URL for your presentation with your audience so that they can follow your presentation Live. Furthermore, Presentain also enables you to get instant audience feedback by conducting polls and ask questions. Presentain has a free version with limited functionality which you can use to test out the service before opting for an upgrade. You can get an overview of the Presentain web service via the developer’s video given below. Presefy is a service similar to Presentain which allows broadcasting an uploaded PDF or PowerPoint presentation. Your audience can follow your slides Live via your Presefy account URL. Presefy is a free service, however, the paid version gives better options such as the utility to password protect viewing for your presentation, so that only designated people with the password can access the content; as well as other options like more cloud storage space and the option to enable download for your slides. Prezentt is a web service which is not just meant to broadcast slides but to engage your audience. Prezentt can be used by uploading a PDF presentation, which like most services of its kind can be broadcasted via URL. But that’s not all! Your audience can interact with you by sending questions and comments. Furthermore, the audience is automatically emailed the slides once your presentation is concluded. You also get real-time statistics and marketing data to determine potential leads. This is another good free service to broadcast your PowerPoint slides. 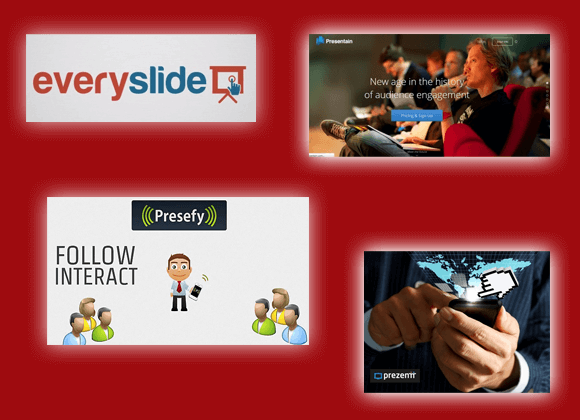 Preso TV supports making slide decks using PowerPoint, Word and PDF files. You can even fetch content via Google Drive, box or your Dropbox accounts. Unlike other slide broadcasting services, Preso TV also allows scheduling your broadcasts. If you know of a good method or service for broadcasting presentations, do share it with us by leaving a comment below. You might also like our list of Best Polling Software and Solutions for Live Presentations.